Siltcoos Lake is a large (1280 hectares), shallow (mean depth 3.3 m; maximum depth 6.7 m) lake located on the Central Oregon Coast, just south of Florence and bordered by Dunes City, Oregon. The outflow and water level of Siltcoos Lake is regulated by a dam on the Siltcoos River 4 km upstream from the Pacific. Several permanent streams feed the lake from its 176 square kilometer watershed including Fiddle Creek, Maple Creek, and Woahink Creek, the outflow from Woahink Lake. Much of the watershed is forested and used for timber harvest, residential development, and limited agricultural production. The lake is popular for recreational activities, particularly fishing for wild coastal Coho salmon, rainbow trout, cutthroat trout, largemouth bass, bluegill, crappie, and yellow perch (Buckman 2004). The lake is also the domestic drinking water source for approximately 125 of the 1330 residents of Dunes City and numerous residents outside the city limits within Lane and Douglas Counties (LCOG 2002). During the fall of 2007 a dense bloom of the potentially toxigenic blue-green algal species Anabaena planktonica prompted Dunes City, the South Coast Water District, the Lane County Health Department, and the Oregon Department of Human Services to issue an advisory against usage of Siltcoos Lake water for drinking and other domestic use (DHS 2007). Residents dependent upon Siltcoos Lake were forced to find alternate domestic water sources for a total of 52 days. This incident was part of a long history of water quality problems including dense algal growth and excessive growth of the non-native aquatic macrophytes Brazilian elodea (Egeria densa), parrotsfeather (Myriophyllum aquaticum), and two-leaf water milfoil (Myriophyllum heterophyllum) (Pfauth and Sytsma 2005; Johnson et al. 1985; McHugh 1979). Because of the water quality problems, the Oregon Department of Environmental Quality (DEQ) placed the lake the 303(d) list of impaired water bodies; specifically due to violations of the “aquatic weeds and algae” water quality criterion (DEQ 1998; DEQ 2006). Dunes City has acted on water quality concerns for both Siltcoos and Woahink Lakes by issuing a temporary building moratorium (Dunes City 2006a), a septic tank maintenance ordinance (Dunes City 2006b), and an ordinance limiting phosphorus use (Dunes City 2007). Preliminary assessments (Johnson, et al. 1985, LCOG 2002) indicate multiple sources of water quality problems including excess nutrient and/or sediment loading from residential development, poorly functioning on-site septic systems, private forestry and agricultural practices and introductions of non-native aquatic plant species. 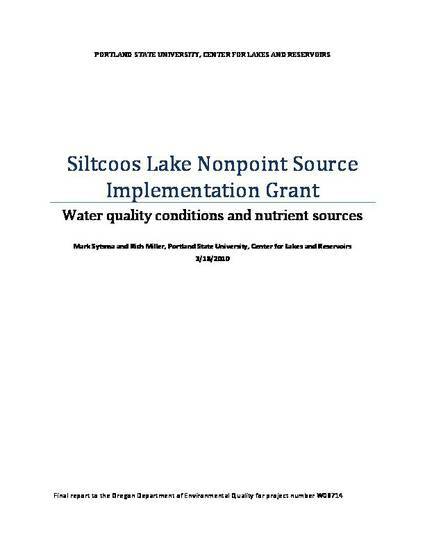 This report summarizes data collected by Portland State University and project partners between June 2008 and May 2009 to better define water quality conditions within the lake as well as potential nutrient sources. Physical, chemical, and biological data were collected at lake and tributary sites over the one year period. Data were evaluated across sites, depth and the season. The information collected will contribute to total maximum daily load (TMDL) development for the Midcoast Lakes and can be used to identify and prioritize restoration activities in the Siltcoos Lake watershed.